Children will enjoy recreating the menu of fruit kebabs with this game. Just drag and drop the fruit pieces onto the skewer to go to the next level. 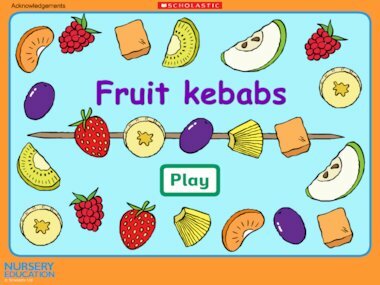 You can also play this game with the activity sheet, ‘Fruit kebabs’, available in our web resource bank. I think pizza n pie is a very good game once you play thats you your in to the game for ever its very atractive. I think from me that pizza n pie should be a top 10 game.